Princess Eugenie arrives for her wedding to Jack Brooksbank at St George's Chapel in Windsor Castle. 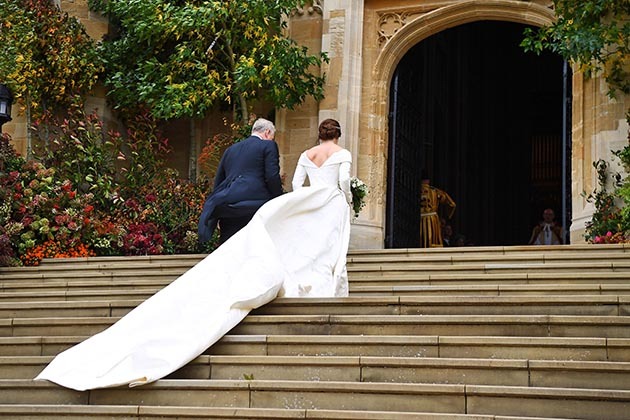 Newlywed Princess Eugenie drew admiring glances from guests as she walked down the aisle at St Georges Chapel, Windsor in a stunning floor-length gown. Who designed Princess Eugenies wedding dress? 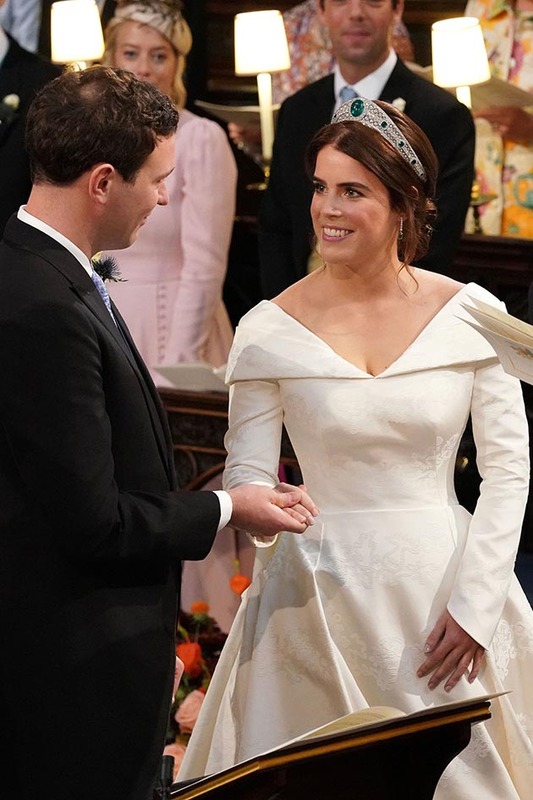 Princess Eugenie walked up the aisle to marry Jack Brooksbank in a gown designed by an Australian designer Peter Pilotto. The satin white off the shoulder dress was floor length with long sleeves. While her wedding shoes were by Charlotte Olympia and she was carrying a bouquet by Patrice van Hellen Oakes. Her hair by Sonny-Jo Macfarlane at Haris was pinned back into a bun and her make up was done by Bobbi Browns Hannah Martin. A statement released on the official website for the Royal Family read, “During several fittings the dress was developed layer by layer, constructing it from the corset and the complex underskirt to the fitted bodice and full pleated skirt. “The dress features a neckline that folds around the shoulders to a low back that drapes into a flowing full length train. Unlike Meghan she wasnt wearing a veil, but instead had a dress with a low back, apparently to show off her scar, from her back operation when she was younger. She also wore diamond and emerald drop ear-rings, which she had been given as a wedding gift from Jack. Eugenie had been tipped to wear the distinctive tiara – featuring a platinum scroll with a floral pattern – the Duchess of York wore for her marriage to Prince Andrew in 1986. The choice would have been the ultimate tribute to her mother, and also ticked the boxes for the something borrowed component of her wedding outfit. Gifted by the Queen and the Duke of Edinburgh the tiara also features diamond collets – a type of setting – and a large diamond of around five carats on the top. But in a surprising move, Eugenie went against public expectation and actually opted for the Queens Greville emerald Kokoshnik tiara – adding the something borrowed element. Made by Boucheron for Dame Margaret Helen Greville in 1919 it features six emeralds, and was also said to be a favourite of the Queen Mothers. When the 28-year-old royal teased fans earlier this year with the news that her wedding gown would be fashioned by a British-based designer, all eyes turned to luxury ready-to-wear label Erdem – a brand also favoured by fellow royals including the Duchess of Cambridge. Odds by Ladbrokes just ahead of the Big Day put the high-end fashion house as favourite with odds of 2/1 with Suzannah (9/2), Jenny Packham (6/1), Oscar de la Renta (6/1) and Preen (8/1) completing the top five predictions. Beady-eyed royal fans also couldnt contain their excitement when Maid of Honour and older sister Beatrice, was snapped leaving Ralph & Russo in Mayfair on Friday October 5th with a mystery box in hand. The Haute Couture label was also on the list of speculated designers for Meghan Markles wedding dress. 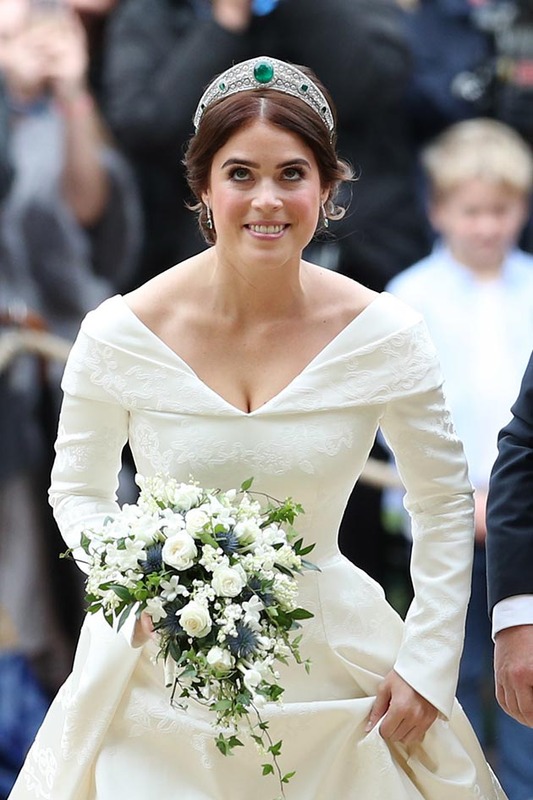 The post Princess Eugenie honours the Queen as she stuns in spectacular wedding dress appeared first on Woman Magazine.